A popular Passover dish recommended for Passover in cookbooks from the 1900s was Kalbsbraten (veal roast), often served with compote. Pour hot fat over prepared meat in a pan, and roast in moderate heat. One calculates 12 minutes for the baking time for ½ kg; fifteen minutes for a roast under 3kg. For the sauce one can add an onion according to preference, and add as much water as necessary, when the onion is lightly brown. Before serving, pour the sauce through a sieve, remove the excess fat and stir in cornstarch or corn flour. Veal roast sounded so delicious and easy to make, I couldn’t wait to try it. I called ahead to a New York butcher, who informed me it would cost me $120 dollars to serve a meal of roast veal for four people. So I decided not to serve veal. Compote, however, could easily be served with other dishes and didn’t require expensive ingredients. 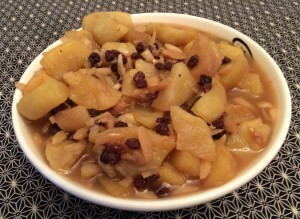 Compote is a mixture of fruit cooked with sugar and spices; many Jewish cookbook authors frequently recommended compotes as accompaniments to meat, fillings for desserts, or served alone with a sauce. In Die israelitische Küche, Henny van Cleef recommended compote twice in her Passover menu, once served with a veal roast, and a second time a dish served after a meal of roast liver, potatoes and dumpling soup. Cleef’s cookbook had recipes for compotes made of plums, apples, pineapples, cherries, melons, huckleberries, and even roots vegetables. I chose her apple compote, since most other fruits were not yet in season. 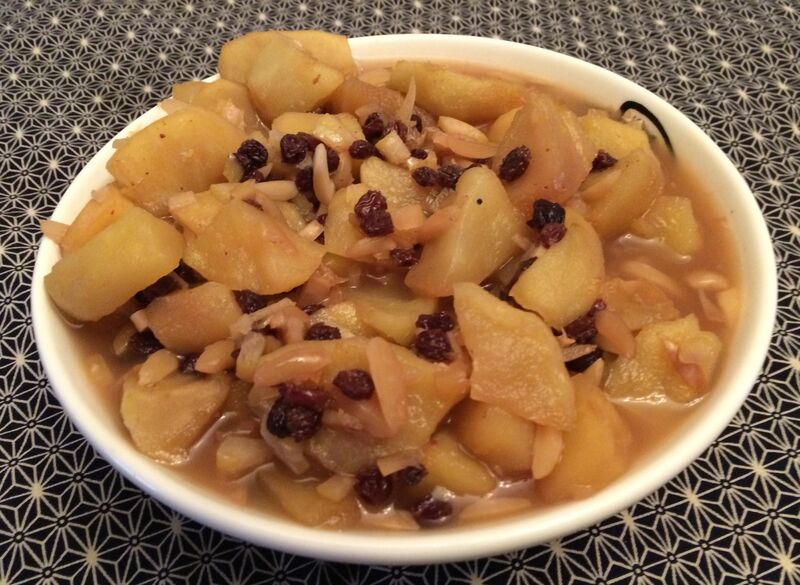 Here is the recipe for the apple compote with currants (page 156). This compote is best a filling for dumplings or tortes, but can also be used as compote. One cuts the apples, after they are peeled, in fourths, and removes the seeds, and cuts the apple in pieces. Place altogether with one glass white wine (or a glass of water), picked through and washed currants, finely cut lemon peels, long cut sweet almonds, sugar, and whole cinnamon and let it cook until soft but not mushy. 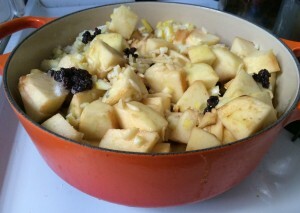 Cleef’s compote was easy to prepare and required little labor with the exception of peeling and coring the apples. The only difficulty with Cleef’s recipe was that she didn’t provide any quantities. Fortunately, compote recipes haven’t changed much over time, so I used a similar recipe in James Beard’s American Cookery to get the correct portion sizes for Cleef’s recipe. The final recipe was good, but not great. The combination of lemon peel and wine made the compote taste a little bitter. Although none of my guests disliked the compote, no one liked it enough to ask for seconds.